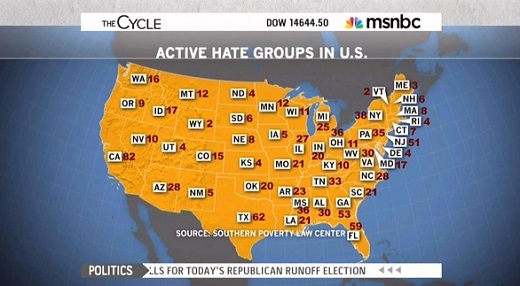 The recent murders of local prosecutors in a north Texas county -- possibly at the hands of white supremacists -- was the news hook for MSNBC's The Cycle to bring Heidi Beirich of the left-leaning Southern Poverty Law Center (SPLC) on to the April 2 program. In introducing the guest and justifying her expertise, co-host Ari Melber merely described the SPLC as "a group that documents that state of hate groups in America." The criticism that we get most heavily from the right-wing are complaints about our listing of groups like the Family Research Council or the American Family Association as anti-gay hate groups. And the fact of the matter is that those organizations are akin to many of the white supremacist organizations that we list in the sense that they lie about gay folks. White supremacist groups lie about African-Americans. In the case of something like the Family Research Council, they put out all kinds of defamatory information about how gays are child molesters at higher rates and so on, with the intention of destroying that particular population and making them appear to be lesser. So, you know, for us, it's a no-brainer to put groups like that on our hate list. At that point, Cupp reminded Beirich that Corkins committed a "hate crime... when [he] stormed the [Family Research Council] building in D.C. with a bag full of Chick-Fil-A sandwiches." Oddly, Cupp forgot to mention Corkins had a semiautomatic pistol and shot the security guard, but that omission may not have been intention. Regardless, it might have confused viewers who didn't know about the August attack because of a lack of media coverage. For her part, Beirich protested that the SPLC was "all about is trying to stop domestic terrorism" like Corkins's "disgusting, terrible incident." Again, perhaps because Cupp was not quick on the draw, she failed to fire back that Corkins admitted at his sentencing that he was inspired by the SPLC website. He admitted to opening fire at the FRC, which is a conservative, pro-family group, and wounding the security guard there. And his actions were designated an act of terrorism, to which he also pleaded guilty.